This St. Brigid's cross is a hand crafted cold cast sculpture that is plated in bronze and carefully polished to highlight the elaborate detailing. 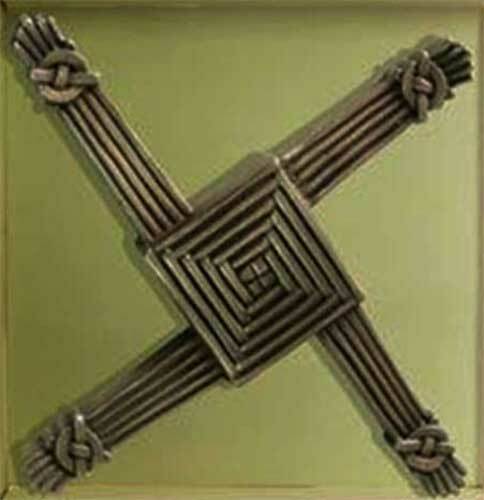 This St. Brigid's cross for the wall measures 7 3/4" wide x 7 3/4" tall and it is ready to hang. The bronze plated St. Brigid's wall cross is made in Ireland by Celtic Shadows and it is gift boxed with a St. Brigid's history card, complements of The Irish Gift House. St. Brigid's cross for the wall is crafted of fine Irish pewter that is enhanced with embossed detailing. Belleek St. Brigid's wall cross is crafted of fine Irish china and it is enhanced with hand painted shamrocks. 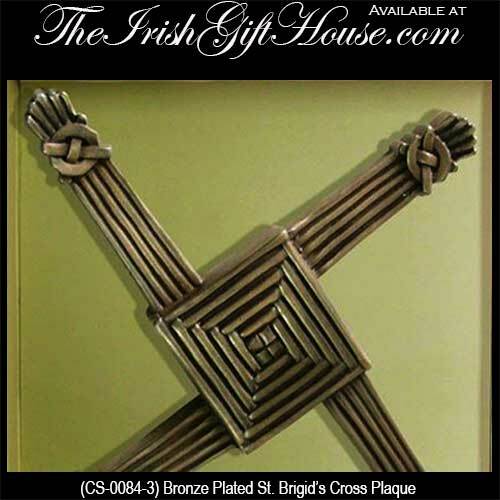 St. Brigid's wall cross is crafted in Ireland using 7 different types of wood. St. Brigid's wall cross features a dimensional design that is made of Irish turf or peat.